Pest control services tailored to bring you the peace of mind that comes with living in a safe, comfortable and pest-free home. Let our team of pest control experts earn your trust in providing a safe and effective pest control solution for your environment. Our services safely protect your property and prevent the wide variety of pests that seek to enter and sometimes even seek to destroy your home. Once we begin protecting your home with our high quality service you will see the results you are looking for. Safely protecting from the outside in, keeping pests out with regular exterior X Out ® treatments. Our complete pest control program starts with a thorough inside and outside treatment performed by a professionally licensed technician who will create a customized program that specifically targets any current pests and begins preventing future pests. About 30-45 days after your Initial Treatment, your technician will return for your first regular exterior treatment to inspect and take new action to eliminate any surviving or newly hatched pests, which starts off your regularly scheduled outdoor pest control services. Your complete custom program is designed to control current pests and to prevent future pests. 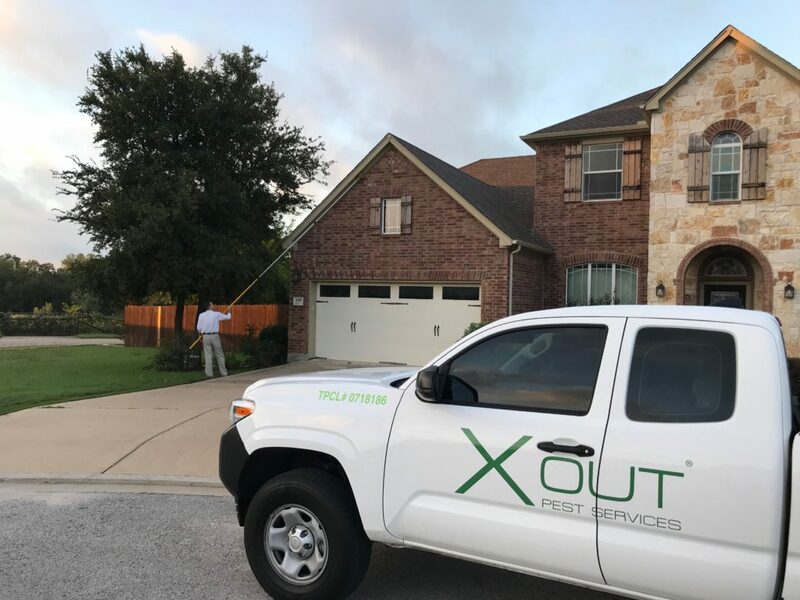 During each treatment, your technician will apply barriers of protection around the exterior of your home and surrounding property, creating a sustained safeguard around the exterior that keeps bugs out of the inside year-round. Inside treatments are always free upon request or as needed just in case the rare occurrence happens of pests finding a way around our barriers; like from underneath the home for example, or through the plumbing penetrations. Sometimes pests are carried in with plants, groceries, or by some other means. Either way, we will take care of it. We believe in the quality of our work and proudly back our pest control services with a re-service guarantee that ensures you get unlimited free additional treatments in between regular services if needed or until you’re completely satisfied with the results. If you need additional pest control treatments at any time either inside or outside your home, simply call us and we’ll take care of it. See our complete guarantee for additional details. Our pest control service is the right choice for eliminating ants, spiders, scorpions, crickets, earwigs, roaches, wasps, millipedes, centipedes, silverfish, mice, rats and much more. Even fleas, ticks, grasshoppers, moths and beetles are eliminated with our quality services — and we guarantee that you get the results you want. It’s never too early to take a proactive approach in protecting and preventing pests from entering and nesting in your home. Call us today to for a free estimate. When you call us, you’re making the right call — one that will lead to a pest-free home now and in the future.